This zombie is only half the zombie he used to be... although ripped apart, he's still convulsing, moving and not going down without a fight! He moans and groans while lifting his head up and down, with amazing thrashing head motion, while his spine wriggles back and forth... Disgusting, Gross, Scary and Disturbing! Turn him on and catch unsuspecting visitors with a heart-pounding, startling surprise... Scream at your own risk!!! Comes with audio CD that you play in your own CD player. All electric and uses regular household current (USA). *Runs continuously - not motion or sound activated. 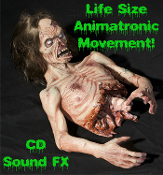 Uniquely Disturbing, Horrifying haunted house or cemetery graveyard scene, high quality deluxe special effects prop with CD for amazing sound and sight FX!! !